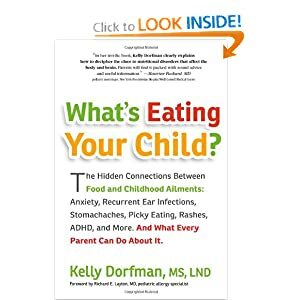 Kelly Dorfman is a food detective like no other, her book What’s Eating your Child is amazing. I read it this past weekend and she further confirmed to me that our eating habits need work. Now, that being said I am a lucky mom. Jack has always loved fruits and veggies, he isn’t a big meat eater but the boy does love his carbs and it seems to me that when he eats bagels or pancakes or crackers then he eats ALL day. When he starts his day with protein and fruit he seems to be calmer. This is worth testing out some food trials. I suspect that we are dealing with a wheat or gluten intolerance and I know I have a milk/dairy issue that I am guessing he may as well. Here goes nothing…. a wing and a prayer. We are trying it again! Any tips and tricks you can share? Please do! This entry was posted in What's Eating Your Child and tagged dairy free, gluten free, Kelly Dorfman, kids, lifestyle, Mama Bird Nest, Mama Bird's Nest, mom blogger, nutrition.